To illustrate a simple pattern, begin by working a foundation chain, then work a single crochet in the 2nd chain from the hook and in each remaining chain across. Now working in the remaining loops on the opposite side of the foundation chain, single crochet in the remaining loop of each chain across. 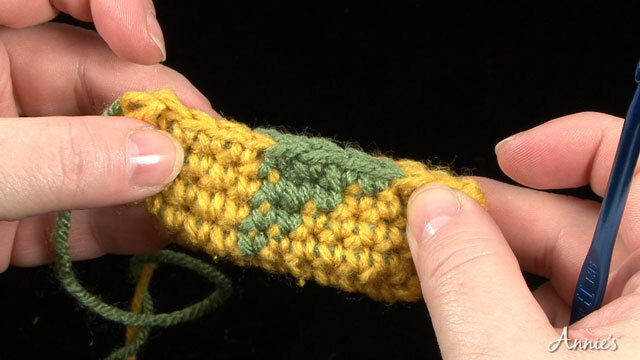 *Carrying the second color along top of single crochet being worked in, insert hook in indicated stitch, yarn over, pull loop through, yarn over (see Stitch 1), pull through both loops (see Stitch 1 Front and Stitch 1 Back), repeat from * across to the stitch in which you would like to change colors (see Stitch 2, Stitch 2 Front and Stitch 2 Back). When you’re ready to change to the second color, leave the last 2 loops of the working color on the hook, yarn over with the second color (see Stitch 3) and pull loop of second color through those 2 loops (see Stitch 3 Front and Stitch 3 Back). Carrying the first color on top of the stitches as you go (see Stitch 4), continue single crocheting in the second color (see Stitch 4 Front and Stitch 4 Back). Change colors back to first color as previously stated (see Stitch 5) and continue the round per pattern instructions for the desired design, carrying the unworked color on top of the stitches (see Stitch 5 Front and Stitch 5 Back).